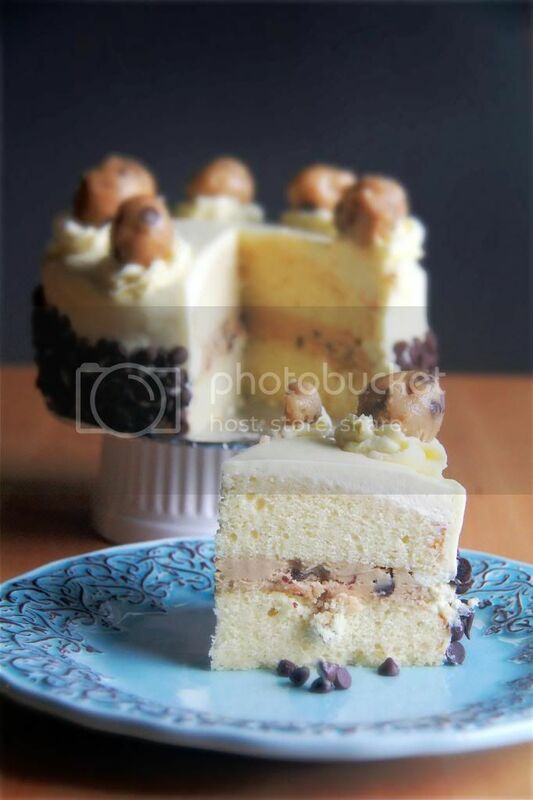 Crumbs and Cookies: chocolate chip cookie dough cake. 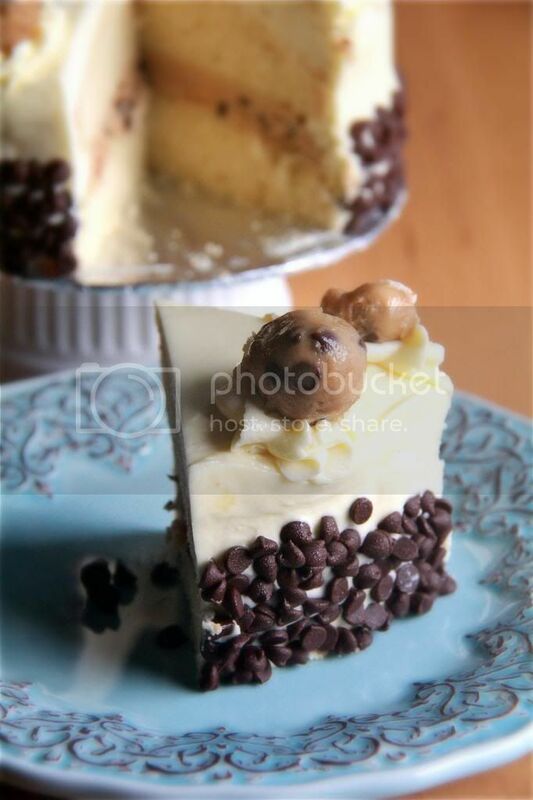 chocolate chip cookie dough cake. I'm a little slow when it comes to following trends. I mean, I know what sort of dessert is popular at the moment but it takes a while before I actually make it. There's just so many things to bake and so little time (and calorie allowance). Chocolate chip cookie dough cakes/cupcakes were wildly hot quite some time back, but I only recently finally got to bake one. And I'm so glad that I did! 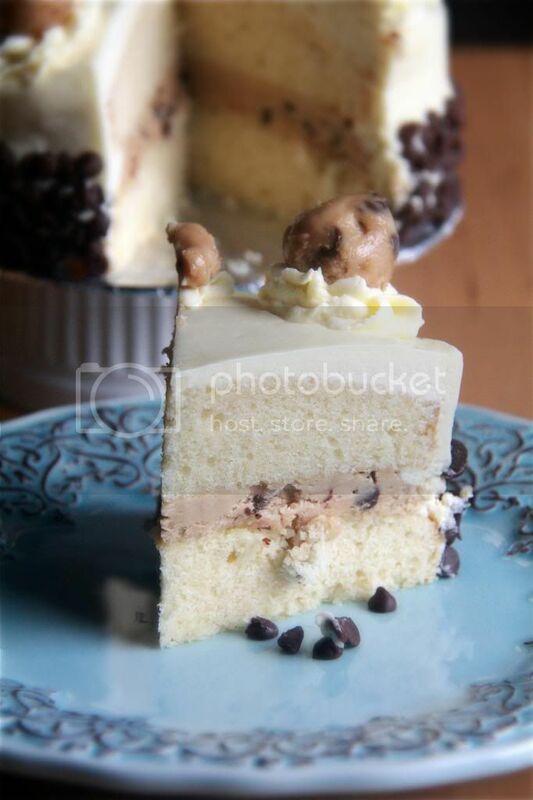 Sure it's just vanilla or yellow cake, chocolate chip cookie dough and cream cheese frosting all assembled and packaged up nicely, three very common recipes made time and time again each for different purposes, but together, they are really something. 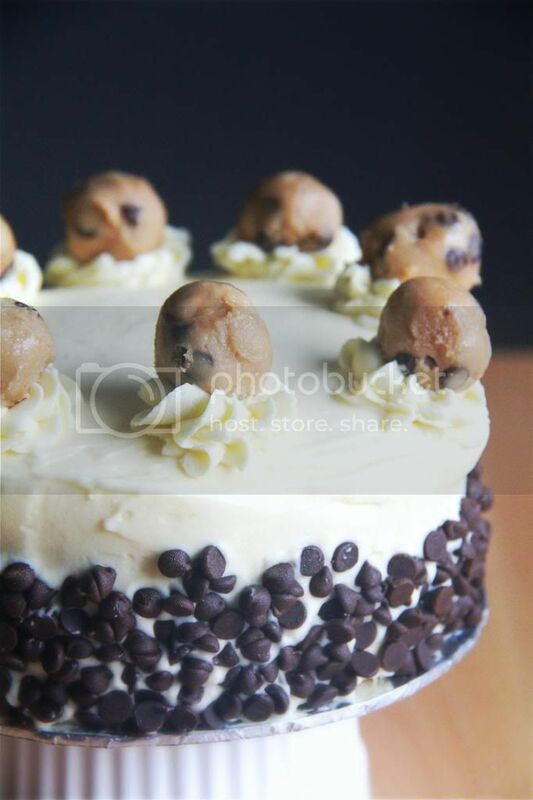 Of course, I think simply the idea of a chocolate chip cookie dough cake accounts for a part of my adoration of this cake. The yellow cake recipe is a new one for me. It's really good- fluffy and moist but not as eggy as I would like. It's also a bit sweet but that's easily remedied. I think it would do equally good or even better in other applications, like as a cushion or a vehicle for fruity buttercream. It's pretty hard to find any fault in cookie dough, but I must say that I would prefer a version with more flour in it so that the resulting dough has a less sticky and firmer consistency at room temperature. It's a texture preference thing; very subjective, so you could follow the recipe as it was originally written and overlook my opinion. The cream cheese frosting, ohmigod the cream cheese frosting, is absolutely divine! It's not too tangy, which I like, and it has a creamy airy consistency that makes it just the right firmness to stick your fork into straight out of the fridge. The secret? Whipped cream. I should have known- the wonders of cream has no bounds. Make the cake: Preheat oven to 350F. Prepare two 5-inch round baking pans. Sift the flour, baking powder and salt together into a bowl. Cream the butter and sugar until light and fluffy. Mix in the vanilla extract and egg until just combined. Alternatively stir in the flour mixture in three additions and milk in two, starting and ending with the flour mixture. Divide batter evenly between the two pans and bake for about 12 minutes or until an inserted skewer comes out with a few moist crumbs attached. Cool cakes in pans 5 minutes before unmolding out onto a wire rack. Cool completely before frosting. Make the cookie dough: Cream the butter, sugars and salt until fluffy. Stir in the vanilla extract and milk. Stir in the flour just until incorporated. Stir in chocolate chips until evenly distributed. Spread bulk of frosting onto a layer of cake; top with the next layer. Use the reserved cookie dough for decorating later. Chill the cake while you prepare the frosting. Make the frosting: Cream the cream cheese and butter until smooth and combined. Stir in the icing sugar and vanilla extract and beat until light and fluffy. Whip the cream to stiff peaks. Fold in half the whipped cream into the cream cheese mixture until mostly combined. Fold in remaining whipped cream until the mixture is homogenous. Use to frost immediately or refrigerate first if too soft to work with. Chill the frosted cake for at least 4 hours for the frosting to firm up before serving. Cute cake! 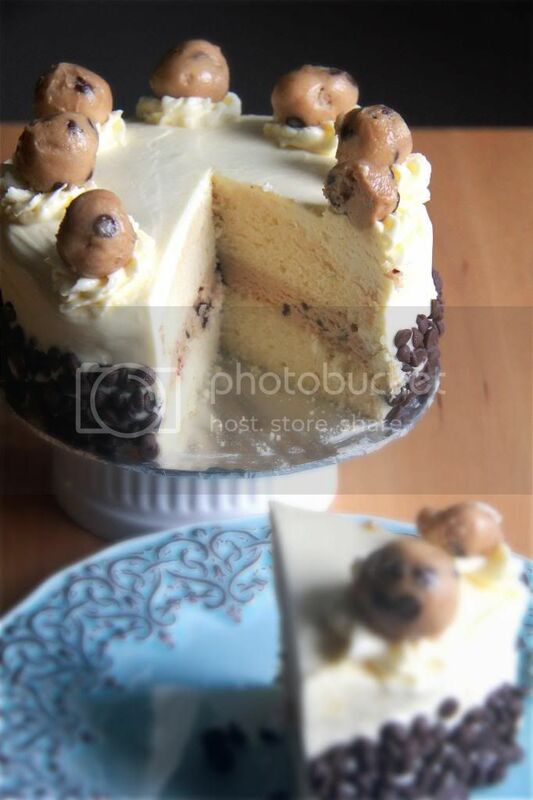 I have yet to make a chocolate chip cookie dough cake :) The yellow cake looks like it has a really good texture! This sounds so incredibly delicious, I am definitely wondering why I still haven't got round to making a cookie dough cake! 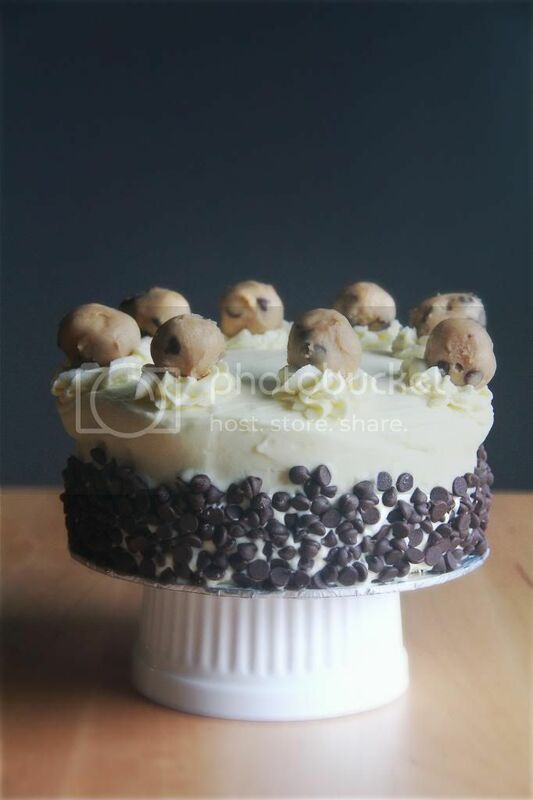 I love the cookie dough decoration on top. buttery white chocolate-macadamia drop cookies. pink strawberry and vanilla birthday cake. chewy chocolate chip and walnut cookies.